FMQ is something that one must practice to improve, and like writing, improvement only comes with regular repetition. But who has the time? And there’s no real reward to practice, just the flexing of a muscle and a few photos to share on Instagram. So, ladies and gentlemen, I’m here to do something about it. Introducing FMQ Practice Party, a friendly way for us to encourage each other and share FMQ tips. Each week I’ll present a shape to practice, and you, if you choose to join us (and you totally should– it’s going to be fun), tag your Instagram photos with #FMQPracticeParty. Here’s what to do. 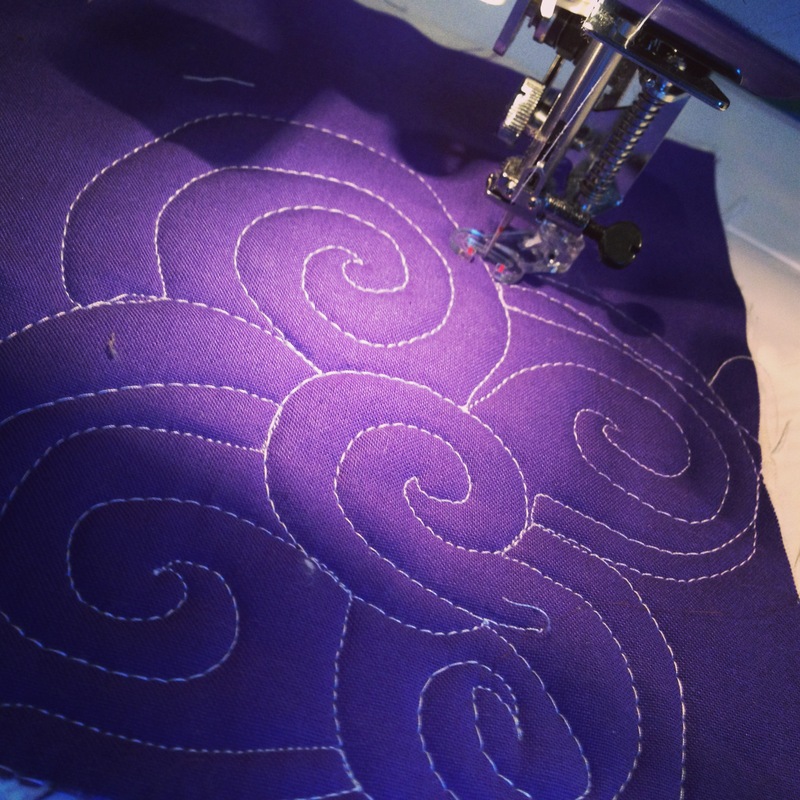 First, re-acquaint yourself with the mechanics of FMQ. There are lots of great online resources and videos out there. I regularly read Angela Walters’s site and Leah Day’s . I also teach FMQ basics at Rock Paper Scissors in Montclair, NJ. But I can always use practice. And I’m still working on those pesky feathers. Next, gather your batting scraps and make some sandwiches with fabric scraps. Then check back here and follow me on Instagram @melintheattic for a weekly assignment. Try to make a regular time to practice for a bit, anywhere from 5 to 30 minutes. We can encourage each other, and who knows, maybe share some resources and tips. See you at the party. First assignment: wavy lines. Make one and then echo it. Try to get control and consistency. Do a lot more than this. Get your body and brain back into the game. Take a picture and tag #FMQPracticeParty. Comment on others’ photos and share your insights. Have fun with it! Then tell me, what do you want to tackle? What are your FMQ goals? i’m so in. so so so in. Great plan! I quilt on my long-arm but need plenty of practice. I tend to dive in, and sometimes that works out well, sometimes not so much! But I just finished pressing a piece of very nice muslin to use as backing fabric for a specific quilt. The quilt will be about 50×54″, and the muslin is about 60×108″. Can you see where I’m going with this? 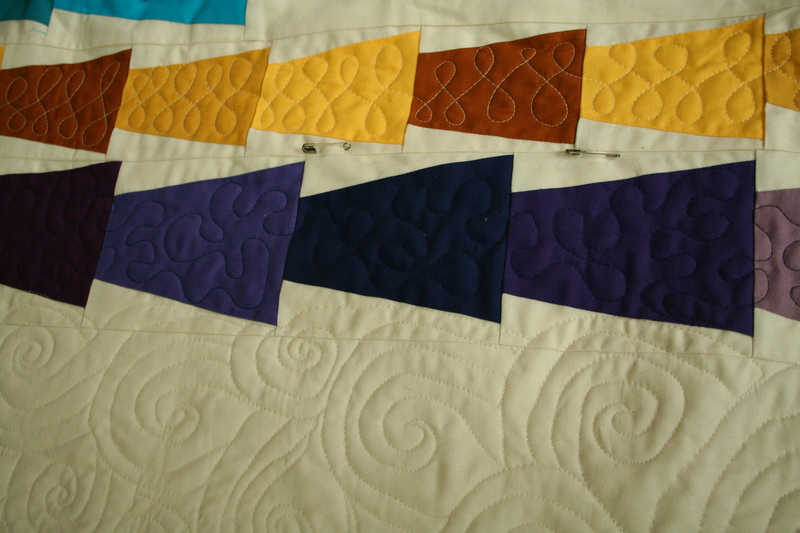 Once quilt is done, I have OODLES of backing left to practice on. And I do like your echoed wavy lines. Good thing to try. Thanks for getting this started. I won’t be instagramming, but I may well pop in for practice tips. Oh no! I hope it comes back to you soon. Count me in! Woo hoo! !